"No You Don't Mr. Pope!" Let's play a little game of "Guess Who Said It"--no Googling. Tough one, right? It could be any number of politicians or pundits (*cough* Trump *cough*). OK, it's a trick question. I did some creative editing and swapped out "Catholic/Catholicism" for "Muslim/Islam." It's actually a line from Paul Blanshard's 1949 best-selling book, American Freedom and Catholic Power. The book argued, quite simply, that American democracy and Catholicism were fundamentally at odds--the two could not coexist in harmony. Tolerance, smolerance. 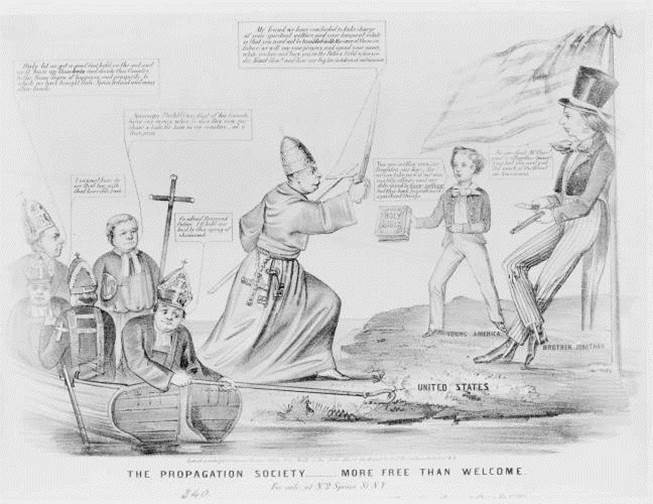 Blanshard saw in the Catholic hierarchy a political force bent on undoing the founding principles of American democracy. Blanshard's book was well-received by his intellectual kin, the leading liberal thinkers of the time. None other than John Dewey commended Blanshard's "exemplary scholarship, good judgment, and tact." The book also gained him notice from a group called, Protestants and Other Americans United for the Separation of Church and State. At this point, the phrase "separation of church and state" was shorthand for "no pubic money to Catholics." Anyway, they brought Blanshard on as their "special counsel." By 1960, Mr. "Positive Thinking" Norman Vincent Peale deployed Blanshardian rhetoric when he thundered, "It is inconceivable that a Roman Catholic President would not be under extreme pressure by the hierarchy of his church to accede to its policies with respect to foreign relations, including representation to the Vatican." Who was he talking about? John F. Kennedy, of course. He was running for president. And that worried some people. Kennedy would respond to this brand of criticism in his address to the Ministerial Association in Houston. “I believe in an America where the separation of church and state is absolute," he assured, "where no Catholic prelate would tell the President how to act, and no Protestant minister would tell his parishioners for whom to vote." To prepare for the speech, Kennedy read Blanshard's book. But American Freedom and Catholic Power was on its way to irrelevance by this point. Instead, John Courtney Murray’s, We Hold These Truths was emerging as the new standard. Published in 1960, the Jesuit proposed that the very idea of American liberty as articulated by Thomas Jefferson and his ilk had distinctly Catholic roots--namely, in the natural law theology of Thomas Aquinas. So what happened next? JFK won, Vatican II led to a rethinking of democracy, and Catholics like Dorothy Day and Thomas Merton became celebrities. Catholics, in other words, were more and more integrated into the mainstream, and less and less foreign to American political structures. Skip ahead to today and we find a Catholic occupying the VP slot on both presidential tickets. No one raises an eyebrow. But if we had a Muslim candidate? Eyebrows would raise. There is an argument to be made Islam is the new Catholicism. The comparison is imperfect, to be sure. But the rhetorical tactic of discrediting not just acts of violence, but rather, an entire global religious community is a consistent theme. It is heartening, therefore, to see Pope Francis addressing this issue with his trademark qualities of balance, intelligence, and compassion. "I do not believe that it is true or right that Islam is terrorist," he remarked on a return flight from his trip to Poland. "Terrorism," he elaborated, "grows when there are no other options and when the center of the global economy is the god of money and not the person." So there you have it. Catholics get it, right? In the wake of Pope Francis's remarks, one American cardinal--who is no fan of the pope--went in the opposite direction. “That simply is not objectively the case,” he said. Burke, who was once archbishop of St. Louis, stressed that he did not want to be “disrespectful” of Islam or “generate hostility.” But he said he worries that many people do not understand that, in his view, “when they (Muslims) become the majority in any country they have the duty to submit the whole population to Shariah,” as the Islamic code of law is known. OK, let's try this: Swap out "Islam" for "Catholic." Sounds familiar, right? It goes without saying that much has changed since the 1940s. Catholics have mainstreamed to the point where their voices are indistinguishable from any other liberal or conservative voices. What if Joe Biden were a Presbyterian? Or Jeb Bush a Baptist? Would it make a difference? I doubt it. It makes me wonder about the reality of the "Catholic vote." Is this category truly a controlling factor in Catholic voting patterns? Or do "Catholic" allegiances simply fall in line with whatever political ideology they favor? Is region, income, race, or gender a better indicator of one's political leanings? I'm sure that someone smarter than me can answer that. But one thing is for sure: Catholics have changed the face of America. And America has changed Catholicism too, by, among other things, giving some among them a very short memory.